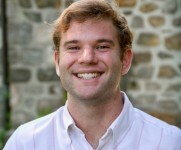 Clayton acts as Glynwood's Development and Communications Coordinator, connecting the public with the organization and its mission, as well as building relationships with donors to ensure that the organization can continue its mission as an impactful part of the Hudson Valley's food culture. Before joining Glynwood Clayton was a student at SUNY Geneseo, where he studied Communication as well as Business and English. Clayton gained experience with the food and farming movement as a farmhand at Rosemary's, a Hopewell Junction-based farm that grows produce weekly for its restaurant in the East Village. As a lover of good food and a Cold Spring local, Clayton is thrilled to be a part of Glynwood's efforts to promote the Hudson valley as a food producing region.